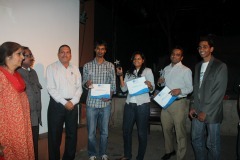 Ajay Reddy : Founder of GoUNESCO Travel Challenge. Ajay is an entrepreneur, a marathoner and a travel enthusiast based out of Hyderabad. He is the founder of the GoUNESCO Travel Challenge, a year long travel contest which requires its participants to visit all the UNESCO World Heritage Sites in India. GoUNESCO started as a travel idea for myself in 2012. I came across a picture tweet which asked how many UNESCO world heritage sites (WHS) I had been to, sadly I could not even recognize half of them. 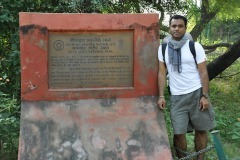 It was a huge blow to my ego as I used to think of myself as someone who knew a fair bit about India and travel. 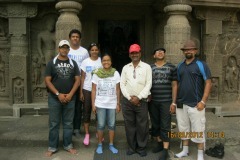 This was the spark that gave me the idea of traveling to all the sites in one calendar year. Since this did not seem too hard (I did not know there were so many UNESCO sites then! ), I asked a few friends if they would like to join too. When they showed an interest, I decided to gamify it to make it more fun. I assigned points to each site and to earn these points, one had to post a picture at the site with that day’s newspaper as proof. Currently, I personally manage the website and the social media properties, but a new website is in the works where I hope to give more responsibilities to the participants themselves. With the launch of the new website, the project will also go global – meaning people will be able to earn points for traveling to any UNESCO WHS anywhere in the world. Naturally, people from anywhere in the world can join and participate in the challenge too. There is already a private mailing list available for GoUNESCO participants where they share travel plans, tips and find partners to travel with too; with the global launch, I hope more people from across the globe will connect with travelers in other parts of the world and travel together. My goal is to encourage more people to travel and through travel understand cultures, heritage and open their minds to new experiences. GoUNESCO is a fun way to do this. In the future, I want the project to become self sufficient with volunteers moderating the site. This way, it can become a true community project. Although GoUNESCO aids conservation and preservation of WHS by raising awareness about them, I want the project to help directly too. Maybe raise funds for their upkeep or convince corporations to adopt a few WHS. If more people travel to these sites as part of the challenge, we might have a strong case to make to sponsors. Which are your top 3 UNESCO World Heritage Sites in India? Bhimbetka was a huge surprise for me that I had never come across this incredible place before. The rock paintings here are over 10,000 years old – yes, that was not a typo – 10,000 years old. There must be a reason for something so ancient to have survived till today. Unfortunately, not many people know about it and there isn’t a lot of help for visitors at the site either. I grew up close to the Western Ghats and have fond memories from the forests there. This site was inscribed to the UNESCO list only last year. I can still remember the continuous rains we used to have 4 months of the year; can get on to your nerves. Sanchi probably has the best location for a structure of its purpose. Stupas are generally used by Buddhists as a place of meditation, what better location than the top of a hill, where the only sounds you can hear are those made by the wind. It is one of the most peaceful places I have ever been to. How many sites have you personally covered as part of this challenge? 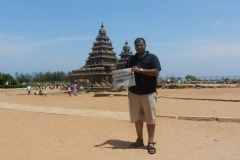 As part of the challenge, I covered 9 UNESCO WHS in India last year. Tell us about the response you got from participants and media. Frankly, I did not expect the response the project received. By the end of 2012, 50 people from across India had joined the challenge and traveled more than 2,50,000 Kms to visit the UNESCO WHS in India. A few of them even traveled abroad. When I started the challenge, it was among a few friends, all of them travel enthusiasts. But as these friends talked about the challenge on their blogs and to their friends, more people got interested. 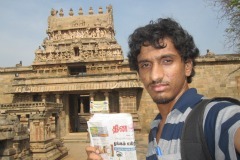 A friend tipped off someone she knew at Deccan Chronicle and that led to the first newspaper article. The media covered the GoUNESCO Finale held in January very well and that has brought in more challengers to join this year. The challengers themselves have taken to the project as their own and that makes me happier than all the media coverage. In fact, one of the participants took it upon herself to get a GoUNESCO t-shirt designed. The challenge has helped forge new friendships as the participants traveled together and shared their tips for visiting different sites. What is the best part of traveling in India? To me, the most exciting part are the adventures you can have, in fact – you will have, every time. Because of the diversity, every journey gives you the opportunity to meet vastly different people from different cultures and customs. At the same time, most of these people are warm and generous. I still remember the day I spent at Khajuraho last year on one of my trips. My friend and I decided to go to a five star hotel for lunch, on rickety, rented bicycles just because we wanted to see the reaction of the guard there. We were allowed in and did have our lunch. That same night, I overslept in the train and missed having dinner. When I told the coach attendant that I was very hungry, he readily offered to share the dinner his wife had sent him. Where else can you have such different experiences in the span of a few hours? Tell us about your most memorable travel experience in India? One of my most memorable travel experiences I had was when I was hitchhiking in the North-East of India in 2010. My friend and I had decided to hitch a ride to Shillong because we had to scramble from Guwahati to avoid a general strike announced there. The North-East is a region where hitchhiking is not known at all, they have had a long drawn insurgency problem and people are generally more cautious. After a few hours sticking our thumbs out at vehicles on the highway, we had all but lost hope when a truck driver stopped and picked us up. 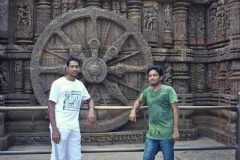 As we were on an extreme budget trip (we were to spend not more than Rs. 150 per day), we told the driver that we couldn’t afford the taxis available to Shillong. The driver took us on board after negotiating a bare minimum fare. After a few kms, he stopped at a roadside food place and bought us tea and some snacks which cost more than what we had paid. The driver, a Sikh, said it was his form of Langar (the Sikh tradition of serving food at Gurudwaras). I will never forget the generosity of that man. How does travel affect you as a person? Travel to me is an avenue for adventure. Thankfully, traveling in India offers a lot of them. Also, I treat every trip as an experiential learning course. I have learned to be more open and receptive to different people and ideas. The generosity I have been extended on many of my budget trips by complete strangers has taught me that it does not matter how big a house you own, what does matter is how open your heart is.